JS500 concrete mixer can mixing 500 litre concrete per hour. With double reinforce shafts & motors, js500 concrete mixer can mix different kinds of materials, and applied in construction projects like buildings, roads, bridges, water conservancy project and so on. 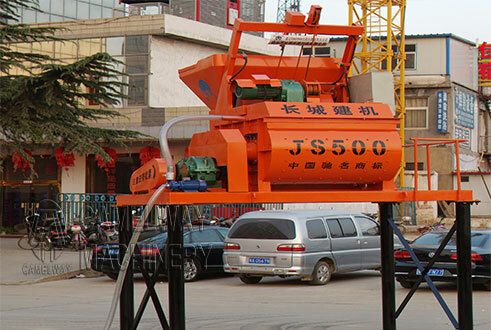 JS500 type concrete mixing machine with two motors power supply, suitable for big capacity. Chinese famous brand motor supplier with reliable best quality. Shafts are reinforced with steel board on surfaces. Blades and arms are screwed on the powerful shafts. Cycloidal reduce with low cost. Planetary reduce with reliable work life, easy maintenance. Shaft end sealing equipped with imported components; good tightness with abrasive rubber. Multilevel shaft seal designs to avoid slurry leakage. If you are interested in our products and want to know more information, please leave your name, nation, and your contact way (email, or phone number, whatsapp, skype, viber, wechat). We will give you a reply as soon as possible.